Dustin Poirier earned a fourth round knockout against Justin Gaethje on Saturday night but he didn't walk away from the fight unscathed. 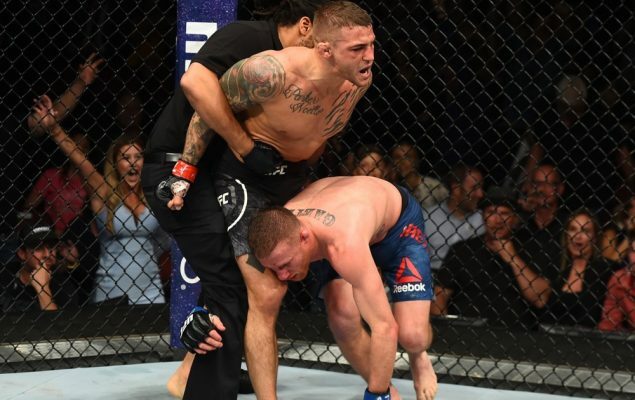 Dustin Poirier picked up a huge win on Saturday night with a knockout against Justin Gaethje but he didn’t walk away from the fight unscathed. During the curse of the main event battle, Poirier ate 50 kicks from Gaethje as the former World Series of Fighting champion just chewed away at his legs. The damage done was effective as Poirier was heard asking his corner to ice down the leg as much as possible between rounds and after the fight he was on crutches getting around the backstage area. Ultimately, Poirier got the win, which is what matters most, but he showed off the after effects of those leg kicks with a set of photos released on Sunday. Of course, Poirier isn’t the first fighter to endure that kind of punishment to the legs but he’ll likely deal with the discomfort considering he got the knockout and an extra $50,000 bonus for his part in ‘Fight of the Night’.